In a word, that is what I think makes the world go around, is worth investing in and is worth living for. It may be, however, that the idea of “love” elicits that eros-driven (to use the Greek for passionate) couples sort of love that is the stuff of mythical romances and movies worldwide. Not exactly what I am talking about here….nope, the type of love that made me pause, rewind and enjoy this weekend had much more to do with lasting-a-lifetime sort of love between not just man and woman, but family members, children, siblings, friends, community. It’s called agape love, or a selfless sort of love that doesn’t rely on passion, but faith. 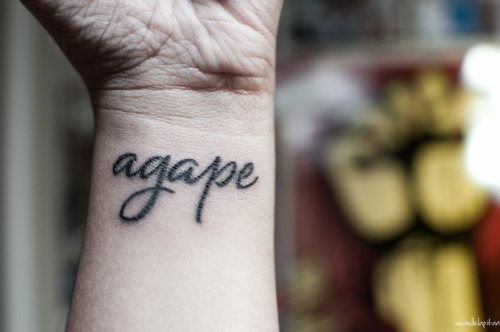 The Greek letting of the word "agape." 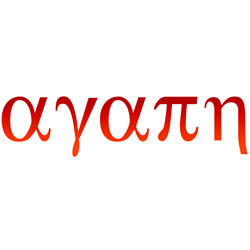 Greek is my all time favorite other language after studying it intensively at seminary. I started to name this journal entry “Happy Anniversary, Sweetheart” and wax poetic on how much I love my hubster Brian. It was humbling to go through my personal journal over the past year, the journey through the heartache and the tears, though letting go and making a difference in my own life. I found that no matter the pain, most of my days are brought to a conclusion with “even though ____ happened, it’s been a great day.” There are so many great, tough, beautiful, awkward, hard, honest moments that Brian and I shared climbing out of our near divorce state and back into the level of trust and relationship that has been the hallmark of “us” for over a decade now. Of the millions of men on the planet, of the literally thousands of men that I’ve met….I chose Brian. Twice. I thought that I would come up with a list of things that I believe make my life worth living. I encourage you to make your own list, and share it with your significant other, friend, child…whatever is appropriate. There is no right or wrong here, just your own view point of reality. I want to affirm that for you, and encourage your effort to really connect with the people that you love on a whole new level. The questions and answers contained within are more about living satisfied and sane than any amount of possessions or achievements. These attributes will help you foster a deep and meaningful life, individually and as a couple/family. Courage. I see in my relationship a great model of courage and stability through Brian. I watch him face the tough times with calm expectation of a good result. I’ve seen this courage in my life through other people that I have loved with an honest heart – my former CEO Bob P., who encouraged me greatly as a young marketing executive. I’ve seen it in my mother, now years after the death of my stepfather, in her daily walk with God. All this courage makes me able to face those Titans in my life, for it is wholly and absolutely contagious. I love the feeling of quiet confidence running through my veins where there used to be panic. I’ve learned from my own life experience that I am capable – and that understanding in your own life will change your reaction to fear as well. Life Question: Can you think of times in your life that you pitched to the mound, even in your fear? Do you let fear stop you? How would your life change if you modeled courage for others in your circle of influence? Faith. While the word encourages the images of crosses and other religious icons, faith is a whole lot more about you and what you believe in your life than the religious orders of the world. Religion is not faith. As humans grow, mature, adapt and develop throughout their lifespan, faith plays an integral part in that thing called hope. Faith is a choice, way more than some random feeling that you get out of systematic law abdicating you from thinking for yourself, or the glory cloud of assigning all responsibility to a divine order. It starts with how you perceive the world: basically safe and good, or basically bad, threatening, not safe. This stems from your first formative ideas as a little tyke. Yes, you can change what you perceive of a safe/not safe as your lifespan develops. The two distinct avenues of faith begin with what you believe about yourself after your mortal life is over. Is there a specific and unique part of your human life that carries on after death? How does your disposition in the greater universe make you feel? Does it enhance and equip you, comfort you, motivate you?Are you a unique and wonderful creature, or meaningless in the greater history of the universe? “Don’t believe what your eyes are telling you. Next, faith addresses how you see yourself, through the avenues of self acceptance and self esteem. Having faith in yourself and your capability enables you to strive for the goals of your life, no matter how great or small. A healthy amount of self actualization is undertaken by having the faith that you’re going to emerge … better. Truth. I have a saying that I live by – what you perceive to be reality is what is real for you. Sometimes, that lands us right in the middle of a conflict between what we really want in our life and where we are. Sometimes, it is the thing that makes us intimate with each other. Brian and I live in a world of mutual truth – and that is a good thing. He knows all the worst parts of me that there are to know, and it’s okay. He loves me deeply with the faults and the failures. We can talk about anything. Our foundational promise? Tell the truth in love. People sometimes think that the concept “truth is relative” means that there is no absolute truth. There are absolute truths for our species regardless of social, political, or economic disposition. The basic human instincts of “do not murder” is shared by our human race. It’s the reason that psycho killers always hide their victims bodies, and that terrorists cover their faces. You see, most all of us have a little voice in our head called “conscious.” Live in harmony with your truth. So social truth is both relative to your perception, and relative to your place in the world-and truth is still out there, waiting for us to make the decisions to find it. It can’t be dictated by which faith system is right or wrong, but what violates your moral code. Truth doesn’t include “should,” as that is an indicator more of social/community perceptions than anything that is truly you. When we accept others truth as our own, we bankrupt our own ability to process in our own moral code. My advice to you? Live the truth that you know. Let it inform your faith. Be excellent to each other. There are three kinds of acceptance affirmations, and all are equally important. Start where you are right now and accept yourself, totally and unequivocally. “This is me as I am – right now!” Accept your weaknesses and your strengths. Accept your faults and your strong points. Start today by saying. “ I accept myself 100%.” Say it until you believe it. Because when you do, you open the doors to unlimited potential. We live in an imperfect world. Begin by accepting the fact that people, things, situations and events are NOT perfect. Nor do they exist in their imperfect state for our disapproval or displeasure. They simply exist. It is not our responsibility to demand perfection. It is not our job to impose our beliefs on the world. No one is perfect. As soon as we accept this fact, we give ourselves the freedom to enjoy life. We are all a product of our habitual thinking. Over time we place restrictions on ourselves. We create invisible boundaries which we accept as our limitations. From time to time, we may try to exceed these perceived limitations, but the discomfort we feel drags us back to our self-made comfort zones. In order to succeed in life, in order to realize our dreams, we need to accept that the only thing holding us back is our mental self-image. Be willing to reinvent yourself. Success is just beyond your comfort zone. Communication. There is a perceived reality in Brian’s world, and one in mine. We share those perceptions together in our ability to communicate freely and without censure. Reconciling those two perceptions into one truth for our life is … communication. I’ve heard lots of people – including my sweetie pie – talk about their partner picking on them (think the real term is bitching.) So how do you communicate in a strained or stagnant relationship when you are chasing your own tail busy – or you’re in relationship with someone that no longer floats your boat? First, find that thing that draws you to each other, that shared interest or hobby. Establish time to laugh and be one, no stress, just open communication. Use open phrases like “I really want to affirm what you’re saying and know that I am listening to you.” Many friends complain that they’ve become stagnant or invisible. If this resonates with you, how can you imagine yourself changing that paradigm? Google the words “active listening” and learn these skills. “The opposite of loneliness, it’s not togetherness. Companionship. I love being a part of the relationships in my life. Did I say that I LOVE it? I do, I do, I do. I love being engaged in discussion, that pitch and catch of ideas when Brian and I can’t sleep in the middle of the night. I love that I spend hours on the phone with D, and that it never is old. I am excited to hear about all the moments of life. I really love talking to my daughter Shea and her hubb Clayton. I enjoy their friendship so much ~ and my daughters familiar, fiery, passionate spirit. In that companionship of my best friend, my husband, my children, I find that there is a deeper meaning to the little things that I wouldn’t have otherwise notice. I love being in love with my sweetheart, being soul twins with my sis D, being Mom to our wonderful children. One thing that we’ve really brought deliberately into the house is a sense of grace and beauty, a peaceful venue where all our gregarious family members can come and chill. My husbands wonderfully comfy man cave has one of the most romantic (and warm) fireplaces in the world. We gather together as a couple, sometimes as a family, and laugh or talk for hours. It may not be the high stakes, speed laced, crazy altitude stuff that Brian, D and I love to do – but it’s also wonderful to have my whole family here living life together. In the absence of chaos (which I despise) there is love, laughter and immense relaxation. We have a true home, and offer it openly to our family and friends. Adventure. If there is a zip line, kart track, hiking trail, climbing facility, outdoor sporting or activity venue in my vicinity, you can imagine that I am going be part of it. Brian and I are headed to our first urban zipline this weekend in the Super Bowl village in downtown Indy, along with the full fan experience, the big game, and the GREAT food that makes Indy such a unique city. It’s pretty cool that there is the USA tallest urban zips right outside our daughters office window on the 8th floor of the Simon Tower. Even cooler that we get to share this wonderful event with our family – specially Taryn and sweet baby Mason. I love adventure, from the bungee jumps of Pigeon Forge, the climbing trails in North Carolina and the rapids of Colorado. How can you find the adventure in your daily life? My sense of adventure stretches to music and discovering new sounds and genres. I can read a book and find myself in extoic and extraordinary spaces. I find adventure in physical intimacy with the love of my life (yes, I am a Cosmo carrying Karma Sutra girl) and coming up with new things. Where is the adventure in your everyday life? Life Question: How do you define adventure? What types of habits change how you feel about your physical and mental state? Knowledge. 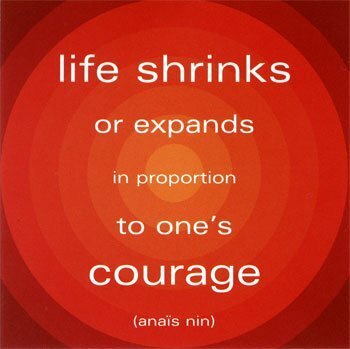 Being a graduate student, first in Divinity and now in Counseling Psych, has taught me more about life, courage and change than any other phase of my development. It’s not because of the classes, but what I learned from being part of the communities. Knowledge doesn’t just come from books. I learned that everything that looks wonderful…may not be. Scary things are often worth doing. Being resigned to your life out of obligation is almost always a deep source of regret later. As a counselor, I learn something from every client that informs how I look at life, circumstances or the human race. You learn so much from truly listening to people with no big guarding wall between you and them. Try being humble and real. Contribute to the world around you in small ways. I’m starting a team project next week working with a population of transitional former inmates; an educational group that teaches job attainment skills. Wow, am I excited. I’ve imagined the pain of the former prison populations comprised of economically depressed youth from hearing their stories. I’ve seen the need for building faith, self esteem, confidence. To be part of a team that helps “the least of us” (not how I see them) become part of this vast society of life…wow. That’s knowledge in action. How does this all play out in real life, this knowledge we seek? Hopefully, it makes you more aware of what you didn’t know. You see, what you know makes a difference. My greatest knowledge is how to balance life, contribution and action in one harmonious orchestra. An easy life doesn’t teach us anything. What we’ve learned and how we’ve grown. 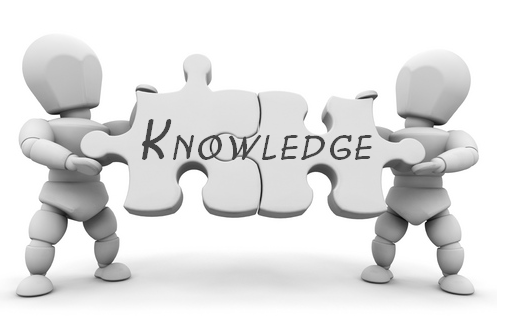 Life Question: Can you construe knowledge as wisdom? Gratefulness? Engagement? Helping others? 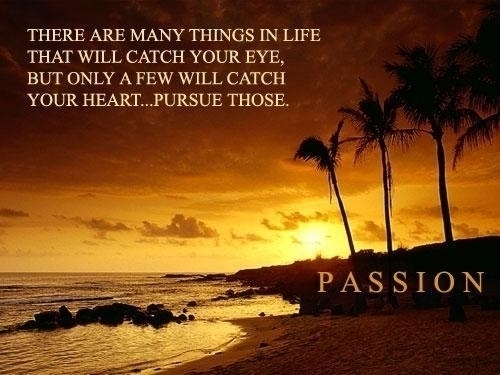 Passing on your passions to those around you? Stability. I can’t tell you how highly I value stability, and loathe chaos and duplicity. When your stable and balanced, you wake in the morning knowing that you’re living fine. There is no need for duplicity because you live full on, honestly and in living color. When your stable, you will see the patterns in your life that contribute to the world around you, that edify your partner, family and friends. You are both trustworthy and trusted. “…Ask in faith, nothing wavering. For he that wavers is like a wave of the sea driven with the wind and tossed. Let not that man think that he shall receive any thing of the Lord. A double-minded man is unstable in all his ways” (James. 1:6-8). Unstable doesn’t work for me. Stability gives you the opportunity to enjoy adventure without using it to numb your psychic pain. I love the unknown, the challenge of exploring the world and trying things that I’ve never seen before in a healthy, constructive way. Stability marks all my important relationships. Brian is one of the most stable men ever. He’s consistent, passionate, adaptable. He’s also gorgeous and that doesn’t hurt. I love being a home body and spending even weeks on end creating wonderful meals for my family and friends, caring for our home, picking up our daughter from her school. I love being a writer and can’t wait to see that book on shelves near you (or Amazon) in just a few weeks. Life is about the learning, about the growing – and about your own stable understanding of self and world. You see, in stability we find a comfortable place to explore our own personal boundaries, our commitments, and our life goals. It’s wonderful when you reduce all the chatter in life and just enjoy a candlelight meal after all those kiddos have lights out. You see, stability is the garden where your life feels free to imagine and grow. Ten Questions that Make A Difference. I picked the following list up from Inc. They’re universal in that they reframe our way of thinking about life to one simple goal: living satisfied. The article, short but worth clicking through on, makes one observation: pictures of dead presidents never made anyone happy. The meaning? Money isn’t happiness. This tattoo designed and inked by Bill at the Tattoo Lounge in L.A.
Here’s the thing. The questions you ask yourself on a daily basis determine your focus, and your focus determines your results. These questions force you to focus on what’s really important. Take heed of them and rest of your life—especially your work—will quickly fall into place.